I am 100% overwhelmed lately. It's amazing how things like Social Media can really fool people because this past week I have received at least 5 texts saying how amazing it is that I have such a beautiful house, and everything so put together with 3 young kids. Social Media is great for creating illusions my friends. Moving to a new house, returning to work after maternity leave, dealing with a very anxious and insecure 5 year old (more on this another day) ,a potty training toddler, teething baby, trying to find time for friends, three kids, my husband and if I'm lucky throw in 5 minutes somewhere for myself. I am exhausted just typing all that out. I remember after I had just had Emma at age 20 a lot of my friends asking me if it was easy to be a mom. It is easy to transform from a totally selfish girl into a selfless mother who would do anything for their child(ren). But being a mom is not easy. It is amazing but not easy. There are many amazing days but today was one of those really rough days. It started off with our youngest son wheezing from his asthma and miserable from teething. Followed by a talk from the teacher about concerns of our oldest Daughter. Which resulted in this mama breaking down and crying right then and there in the kindergarten classroom. And I had half an hour to get to work. I ended up calling in sick so I could take Luca to the walk in. The mommy guilt was really kicking in. Why hadn't I taken him to the Dr. sooner? My work is amazing and is so so good with giving time off when needed for my children. I often wonder how moms do it when there work isn't so flexible. The day also ended in our oldest falling off the monkey bars and breaking her wrist. 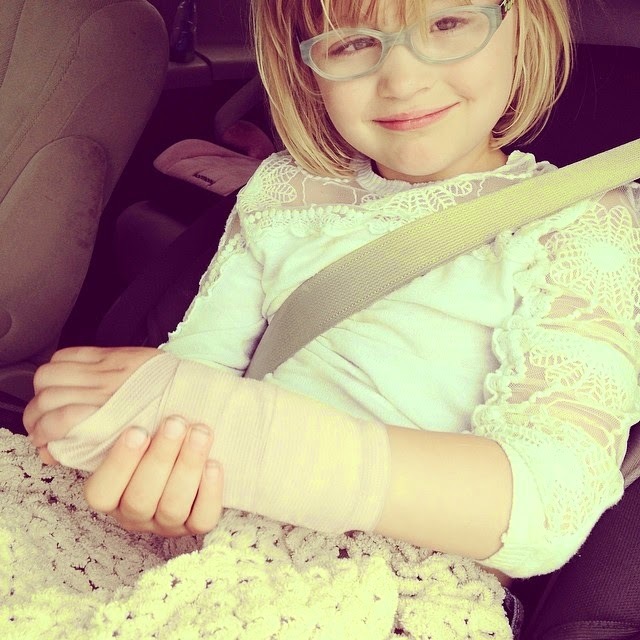 After 4 hours in the Emerg she has a splint on until Friday when we go back to the fracture clinic for her real cast. Today was rough but I have a loving husband and three kids who call me mom and I am so thankful for that. This post is mostly for a good vent. And to let other moms out there who are trying there best and feeling absolutely overwhelmed know that they are not alone. Kelsey, I read this and my heart goes out to you. I only have one child but my struggles and challenges are real and take me through a roller coaster everyday. Social Media is a smokey mirror. You never get the full image. When I see you post pictures I see lots of love. I don't think your days are easy and fairy tale. Everyone in this world has challenges to face. Which is why we should not be so easy to judge one another. I think you are an incredible mom. There is no such thing as a perfect mom or perfect family.Howeveer they can be perfect to us. I dont know what you are going through with Emma but I have compassion for whatever it is. When children get older they get less physically demanding. However the emotional strain they put our hearts and emotions through is exhausting. My son is eleven and I worry more now then I did when he was a toddler. Thankfully we have a great support system. You are doing great! Thanks for sharing your story. Thank you so much for this beautiful comment mom!! you were so right, I totally understand now that I am a mom myself! Love you.